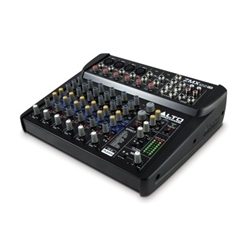 A Superior Mixer for Small Gigs and Dj's...Preamps With a Lot of Headroom.. The Alto Professional ZEPHYR ZMX122FX is a compact, 8-channel audio mixer with 256 built-in digital effects presets, featuring 4 inputs for microphones and line-level signals such as guitars, drum machines, and keyboards. Four of the channels with plenty of headroom, feature balanced 1/4" TRS inputs, as well as gold-plated XLR jacks and microphone preamps, and two balanced 1/4" TRS stereo line-level channels. All six of these channels feature 3-band EQ, Pan, and Level knobs, as well as two Aux Sends. One of the Aux Sends is labeled for external monitors, and the other is dedicated to sending signals to external effects. The two Aux Return inputs, combined with the stereo RCA Aux inputs, make for a total of 12 input channels. The ZMX122FX also features two bus outputs: the Main Outputs and the Control Room outputs. Stereo RCA outputs are also provided. The effects that are built into the ZEPHYR ZMX112FX are the product of a partnership with Alesis. They feature 16 different effects, and 16 variations of those effects, making a total of 256 presets to choose from. A 1/4" input on the rear of the mixer enables you to attach a separately available footswitch, so you can disable the effects with a tap of the foot. The effects can also be muted with a button on the face of the mixer. All of the knobs are color coded, to make it easier to operate the mixer in dimly lit environments. On-board digital effects processor with effects like Reverb, Delay, Flanger, and Chorus.